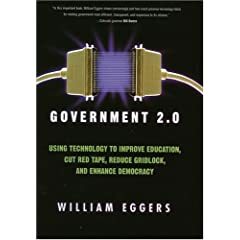 Read the first couple of chapters of William Eggers‘ 2005 book Government 2.0 last week before I had to send it back to the library. Interesting stuff; covers a lot of the areas that people are talking about these days, but in different language then current buzzwords (2005 = olden times I guess). Eggers places lot of emphasis on “sense-making technologies” – using technological solutions to help citizens understand and access government. Why? For too long, government agencies have arranged themselves in ways that are helpful and intelligible to bureaucrats and insiders–but not to regular citizens. With their overlap of functions and jurisdictions, and their arcane rules and procedures, governments can be a confusing maze even for public employees [agreed!]. But for the average citizen or business, government can be downright incomprehensible. Simply finding the right agency to handle your problem can sometimes require painstaking detective work. For years, policy wonks have debated what government would look like in a perfect world. They agree more often than you might expect. There wouldn’t be dozens of different federal job-training programs or agencies with incomprehensible names like the “Bureau of Reclamation.” You wouldn’t get five different answers to your question depending on which bureaucrat you talk to. You wouldn’t be endlessly transferred from one department to another. You wouldn’t have to go to half a dozen different agencies just to open a newspaper stand. You wouldn’t have to wait in line. And you certainly wouldn’t have to fill in the same information again and again and again. I can certainly identify with this – & I’ve been a federal bureaucrat for over 10 years. So how can government solve the “sense-making” problem? One of the cooler ideas that Eggers describes is a kind of IT-enabled virtual agency that would spring up around a citizen or business when they arrive at a government site with an issue or problem. The requester would provide information into an online form and based on their responses, an “intelligent assistant” would be led through the right path to get what they need. Say you need City Hall to clean up the dirty, rat-infesed vacant lot next door. Offline, you’d be forced to fill out separate complaints (and then follow up) with the Department of Health, the Department of Sanitation, the Department of Animal Welfare, the Department of Transportation, and so on. Getting anything done could take months. But online, you would fill out a complaint form that would create a “Vacant Lot Agency.” This “virtual agency” would exist only at the moment you’re filling out the complaint; its job is to assess your complaint and electronically route your problems to all the relevant agencies. You’d then be able to check the status of your complaint at any time, day or night. A beautiful vision to be sure. Realistically though, lots of hurdles though to getting there – at a technical level, even getting various government databases to talk to each other is a major challenge. And then there’s the people who own those databases and their desire to protect their turf. Not to mention privacy, security and similar policy issues… I could go on and on. To be fair, the book appears to attempt to get at some of these issues. Too bad I had to send it back before I could finish it; there seems to be tons of other golden nuggets sprinkled throughout its pages. Sniff. You send it back. Me, I pay $95 a year in late fees. Heh. I pay lotsa late fees too ($24 against Everything is Miscellaneous recently), but this one was an interlibrary loan thru the library @ work.